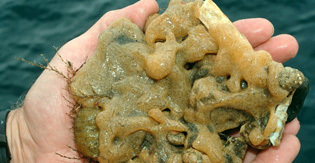 Like the Fouling, an invasive sea squirt has spread around the world, covering hard surfaces like rocks along the shore, shellfish beds, pilings, and boat bottoms. Unlike the Fouling which is crusty and hard, this invader is slimy, which is why it’s often called Marine Vomit (Didemnum vexillum if you want to get technical). It’s been crippling fisheries on both coasts of the US, the U.K. and Europe because it grows over everything and fouls up fishing gear, chokes out shellfish and clogs boat propellers. The slimy stuff is toxic to most would-be predators, except for tiny white snails that seem to have an appetite for it. If you think that’s gross, you might not want to know about the highly scientific method used to find out what the snail ate. One hint: it’s called scatology. ← This 20-Foot Tube of Goo is Alive!